For Konica Minolta Medical Imaging, opportunity arrived in the form of an act of Congress. The Consolidated Appropriations Act, also known as the Omnibus Bill, lowers reimbursement to hospitals and clinics for older radiography technologies that aren’t as efficient as the latest technology, known as Digital Radiography or DR. These changes created a lot of confusion in the field. Seeing a chance to help educate practitioners, while positioning Konica Minolta as a trusted leader in DR, Introworks created a campaign to turn the Omnibus into opportunity for Konica Minolta—and its customers. The challenge was to grab the attention of practitioners and convince them of the advantages of switching from film and Computed Radiography to Konica Minolta DR.
To get the conversation started, we used a horror movie aesthetic for a campaign that exaggerated practitioners’ uneasiness about the bill into full-fledged tongue-in-cheek terror. The campaign was one component in a comprehensive communications strategy, designed to lead prospects along a path of attention, engagement, education and inquiry. To deliver an experience that was personalized and trackable–as well as awesome–we collaborated with dialog marketing firm VLG. Targeted direct mail invitations grab attention and drive prospects to a movie-themed microsite. Advertising was also developed as another touch point to steer more people to the site. 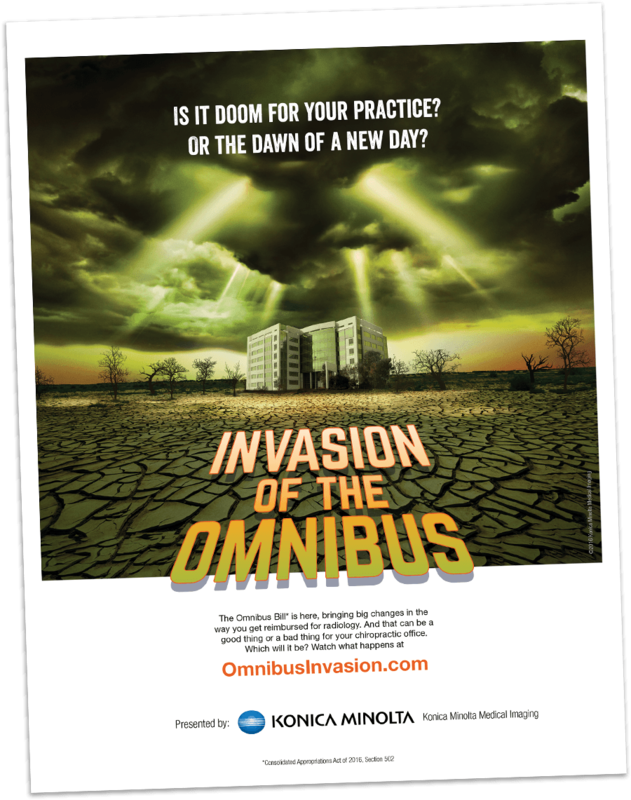 Once on the site, visitors engage in an interactive experience built around a mock horror movie scenario, showing how the Omnibus Bill will affect their operation, and how Konica Minolta is the perfect partner to help bring new possibilities to their practice. The campaign is supported with a palette of educational tools for sales and prospects. With the campaign just getting underway, Konica Minolta is pumped and prepped to help X-ray practitioners take advantage of the Omnibus Opportunity. Stay tuned for the sequel in Phase II! What did you think of this campaign? Are you looking to grab the attention of your prospects? We’d love to talk with you about your next project.